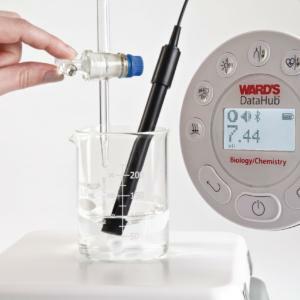 Home > Educational Materials > Chemistry Educational Materials > Applied Chemistry Learning Activities > Ward's® AP Chemistry Investigation 14: Acid-Base Titrations: How does Chemical Structure Affect pH? Ward's® AP Chemistry Investigation 14: Acid-Base Titrations: How does Chemical Structure Affect pH? In this lab, acid-base titrations will be performed in order to investigate the relationship between pH, concentration, and the structure of acids and bases. Students will carry out multiple acid-base titrations and will use a pH meter to monitor the pH of the resulting solutions. Students will then construct titration curves. Using known information and the data that was gathered, students will ultimately be able to determine the concentration of the acid or base, the ionization constant, and the percent ionization. Includes hydrochloric acid, acetic acid, sodium hydroxide, and phenolphthalein. Requires pH meter, burette, ring stand/clamps, magnetic stirrer, and magnetic stir bar, available separately. Ward's® DataHub is not required to complete activity. Ordering information: Activity includes Hydrochloric Acid, Acetic Acid, Sodium Hydroxide, and Phenolphthalein. Materials required but not provided are Graduated Cylinders, Erlenmeyer Flasks or Beakers, Vials/Test Tubes, Pipettes, Burettes, Ring Stands/Clamps, pH Meters, DI Water, Gloves, Safety Goggles, and Lab Aprons.